Her home page is a Ralph Lauren shopping page. But, we assume, it was once valid. I’ve been seeing more and more of these type of links pop up. Do we remove them or add an end date? I think it would make sense to add snapshots as ordinary homepage relationships alongside the ended original link. normally I am good with adding an end date. but with it now being an unrelated link (which may or may not be malicious), I thought I would check. It is no longer displayed on the artist’s home page but is still clickable via the relationships page. Maybe we should consider a way to make certain links display while not being click-able? I think we should use the ENDED attribute indeed then don’t add a snapshot URL. As suggested here, ENDED URLs could be made unclickable, or even better, turned into web.archive.org/*/OLD-SITE.COM. I mean for the display, but behind it’s still the ex‐real URL that is stored unchanged. How is the “ended” date going to be worked out? It will be hard to know when a website was removed for sure. Sometimes I manage to pin point the end month with consecutive web archive snapshots but most of the time not. But the end date is not mandatory, I just check the ENDED attribute and the link goes hidden from side bar already. This is one of those times that a “vague date with reason” field could be used. I often run into situations where “he joined the band in the 20s”, but with no exact date I am forced to leave it blank. We know he left in 1954, but no start date listed. Like the sound of that MBS-2954 idea - only been gestating for six years so should mature soon into something we can use. Seems a nice idea - a dropdown for exact\before\after\approx. Like @justcheckingitout says - it is often a case we know something roughly within a short time period and can put that in instead of nothing at all. “He joined the band in the 20s” means the band would then be found in the correct searches for 1920s music instead of being not found. Back to the OP. By having approx dates it allows someone to point out that “the link is dead today”. “Stopped working before 03/02/2019”. Then later editors can come along and improve the accuracy of that date based on deeper research. Where are the Database Geeks? Are vague dates a thing anywhere else? As far as structured data goes, I can understand why we don’t have “the 1920s” as an option. But it would be nice to be able to leave notes (even if they only appear on the website) for other users/editors. That is actually something I like on WP, they have <! – edit notes --> that are invisible to readers but are available to editors before they make changes. We can use artist annotation for this kind of info. Both readers and editors will be glad to know the band was created in the 20s. lost source: the link might still work but the website linked changed (or the domain was parked). Once again we lose valuable information, as the link was perhaps used to point at a source of information, and this source is now gone, so no one can check back on it. As suggested here, ENDED URLs could be made unclickable, or even better , turned into web.archive.org/*/OLD-SITE.COM . I totally agree on this. And it is more and more urgent imho. 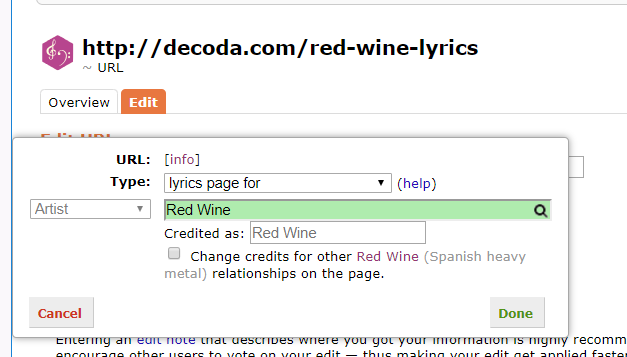 I just noticed a dead ‘lyrics’ link on the band Red Wine but I can’t find a way to mark it ‘ended’ - I see start/end dates for the discogs url, but not for the lyrics. You have to go to the URL entity page (follow the “[info]” link next to URLs on the relationship overview) and then edit the URL entity directly and there you can more fully edit the URL relationships. They are shown for most other link types (except ‘PureVolume page for’) so maybe this is a bug. We are missing those dates for a few cases, I remember I created at least one ticket for that but probably not lyrics. But as lyrics you can easily find them again, I think it is ok to delete and replace by another link. I’ve noticed (and so have many of you, I’m sure) that it’s rather hard/circuitous to get to flag a link as ended when you’re on an artist page.